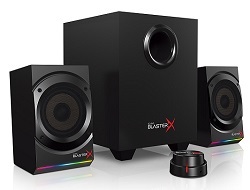 The BlasterX Kratos S5 is the best-in-class 2.1 gaming speaker system with Aurora Reactive lighting system designed to elevate your listening pleasure for gaming and music. Packing powerful 4" satellite drivers and 6.5" subwoofer driver in wooden enclosures, the Kratos S5 delivers clear highs, detailed mid-range, and deep bass. When connected to your PC or Mac via USB, you can also enjoy High-quality 24-bit/96kHz digital audio playback. This Special Offer also includes a FREE! ($29.95 Value) TT eSports Talon Gaming Mouse. The Aurora Reactive lighting system gives you ambient lighting to accompany your games with its fully customizable 16 million colours LED lighting. You may choose from six presets or customize colors and patterns to match your other RGB-enabled peripherals or fully integrate with other Aurora Reactive lighting system-enabled products.